Old Sleepy Eye White & Cobalt 8 inch Blue Rim Pitcher. Old Sleepy Eye was a Sioux Indian Chief born in Minnesota in 1780. A town and a flour mill were named after him. In 1906 - Western Stoneware Co. of Monmouth Illinois started producing Cobalt & White items with the bust of the Indian Chief. These pitchers - creamers - sugars - salt boxes - vases - and other items were used as everyday utilitarian wares. 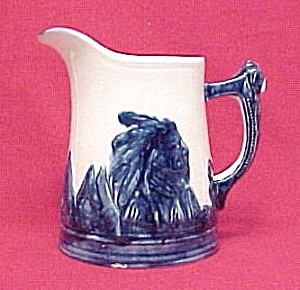 This very collectible #4 pitcher measures approx 8 inches tall to top of spout. It does have some crazing and staining from age that could be bleached out. There is one lower rim chip which shows and one on the handle which is partly under glaze. The chips on underside are very shallow. See photos. It is in very good condition for it's age and probable usage. Would be a very nice addition to an Old Sleepy Eye or Blue & White Stoneware Collection.